For starters, no. This is not about muscle tone, ladies. When you hear the word tone, when it comes to clothing, it means how warm or cool the color is. In my humble opinion a women can wear any color she chooses as long as it's in a suitable tone. After understanding these 4 points, my hope is that you can look at your closet and effortlessly match up your garments. The color wheel is a visual representation of the color spectrum. It breaks down the primary, secondary, and tertiary colors. It also shows complimentary colors. Primary Colors - Blue, Red & Yellow. You can wear any combination of these colors because every other shade on the wheel is made from these them. Secondary Colors - Green, Orange, Violet. These are called secondary because each is complimentary to one of the three primary colors. For example, green is a complimentary to red. How do I know this? The color wheel. Red and green are across from each other. Same goes for blue & orange, and yellow & violet. Tertiary Colors - Yellow/Orange, Red/Orange, Red/Violet, Blue/Violet, Blue/Green, Yellow/Green. These colors are the "in betweeners" on the color wheel. You will find tertiary colors between a primary and secondary color. Think back to elementary school art class (shout out to Susan Tremblay). What do you get when you mix yellow (primary) and orange (secondary)? You get a color that you can't describe as anything but....yellow/orange! Although my hilarious friend, Susan, would tell her art class it's "cheeto". How'd I do, Sus? Grab your coffee and focus because things are about to get crazy. Look at the inside of your wrist. What color are your veins? If they are more blue you have cooler undertones. If they are more green you have warmer undertones. Nutty, right? Glad we had that moment. Again, tone means how cool or warm a color is. The easiest way to explain tone is to look at one color. Let's look at blue. On the color wheel, true blue is naturally a cool color. It's easy for the cooler skin tones to wear true blue, but let's not rule it out for warmer skin tones. Take a look at the spectrum of blue below. These are warmer tones of blue (there are many more). If you're warmer, you know you can rock navy. You can also rock deep purple, and maroon. 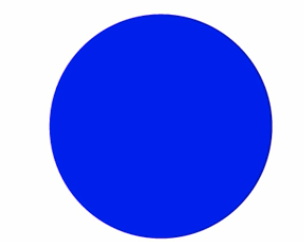 Don't forget that maroons, purples, greens all have blue in them because blue is a primary color. The hues above have one thing in common: each contains blue. This is precisely why a warmer skin tone can pair a maroon sweater with a dark denim and look fantastic in blue tones. Versus a true blue sweater and light denim jeans on a cooler skin tone. 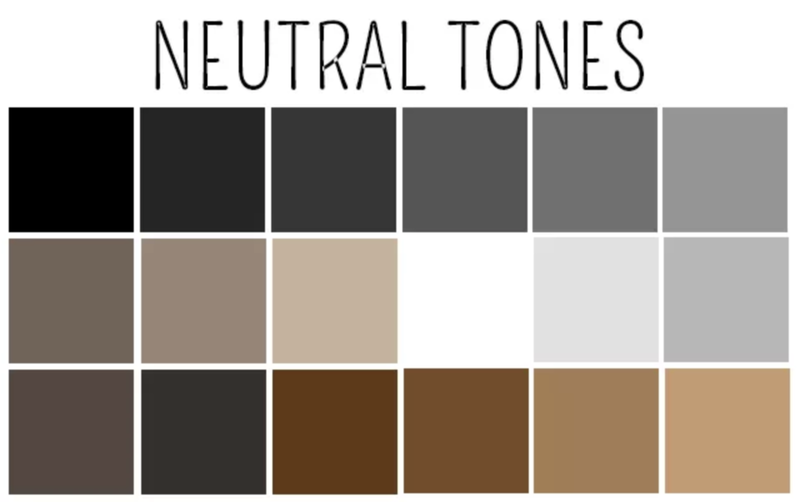 Below is the spectrum of neutrals. Neutrals work on all skin tones. If you think about the items in your closet, which get the most wear? Coats, accessories, bags and shoes. 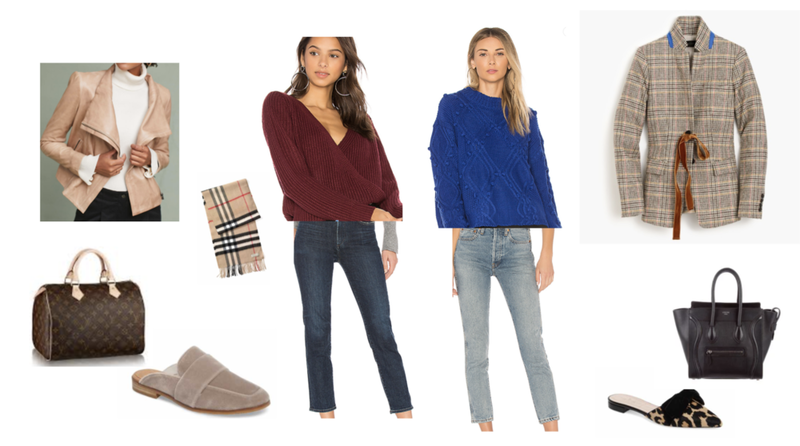 Purchasing these items in neutral tones will make your life so much easier because you can put thought into the outfit, and finish it off with the same pair of shoes and coat you wore yesterday. It's also wise to invest in these pieces because you'll wear them often. Treat primary colors like neutrals, too. You can add a fun pop of color with a bag or a shoe! Let's keep building on these outfits, shall we? If you add a simple neutral coat and shoe to either outfit, it looks great! and how about that investment bag? I'm such a hat girl. Had to add it. Treat these like they are neutrals. Incorporate them in a subtle way with a belt, shoe, scarf or bag. Or you can go big with a boot, coat or tote! The world is your oyster. If you're super scared, go for different textures, or just add a neutral hat! Patterns: If you're a plaid person, stick to primary colors (in any tone). Also, a great go to pattern is houndstooth. Prints: Leopard, cheetah, and tortoise shell go with everything. Metallics: In my personal opinion, gold is great for warm skin tones. Silver is better suited for cool skin tones. I hope you enjoyed this post! Remember, you can wear any color as long as it's the appropriate tone!